An important pest of ornamental, forest and plantation trees this species attacks two and three needle pines such as Scotch, Mugo, Red and Jack Pines. Sawflies feed in colonies, eating all the second-year needles before moving on to new branches. They quickly strip foliage from their host plants. 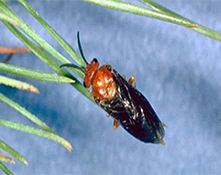 In Southern Ontario this usually occurs in late May/June for the European Pine Sawfly and in July and August for the Redheaded Pine Sawfly. Partially eaten needles look like fine straw hanging on twigs. European and Redheaded Pine Sawfly are the most common in Ontario. The female has a “saw” or ovipositor used to slit or cut plant tissue and aids in the insertion of eggs into these slits. Eggs are laid in slits on current year’s needles in late summer and fall. Larvae emerge the following spring to feed on two-year old needles. The adults have two pairs of wings and often resemble non-stinging wasps. 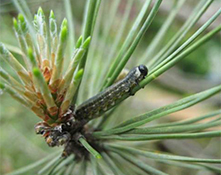 The European Pine Sawfly has a dark-greenish body with dark longitudinal stripes and a black head and appears in late May/June. 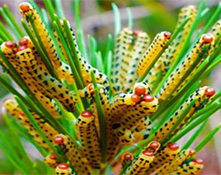 The Redheaded Pine Sawfly has a yellow body with six rows of black spots and a reddish head and feeds on foliage in July and August. Look for young larvae as Amelanchier is blooming or as the Redbud begins bloom in late April to mid-May. Both larvae and their damage can be pruned out. Insecticides should be targeted to younger larvae. Note: BT is NOT effective on sawfly larvae even though they resemble caterpillars.